Almost a year ago LinkedIn announced the release of PointDrive - a professional way to share personalised content to buyers. It's only available to LinkedIn Sales Navigator users and serves to stop all those random emails flying about with attachments and replace them with easily accessed content stores that can be updated, measured and managed centrally. Within PointDrive you can create Presentations. These presentations can host several pieces of content whether links, videos, presentations, PDFs or documents. Once you've created a presentation, you copy a link and share to others via email, InMail, social media etc. LinkedIn will then monitor who has looked at your content using their LinkedIn profile as a reference. It allows the buyer to easily share content with their peers and it enables the Social Seller to understand who within the organisation is involved in the buying decision. Isn't That A Bit Sneaky? Well, yes and no. If you're new to PointDrive there will be a disclaimer on the front that clearly spells out that you're about to enter a portal that will track your movements so it's full disclosure. That said, in an age where our digital footprint is becoming less private, people are becoming a little more sceptical of engaging with these types of tools. This could be a barrier for PointDrive adoption. Since its launch, Social Sellers have been trying to figure out how to get the best out of the tool but in all honesty, it's content hungry. Unless you feed it regularly with relevant content, it will soon expire - yet another reason why Marketing and Sales should align around content. Have you been asked "Do we get a copy of the slides?". Well, now you can! Setup a presentation specifically for event content where you can send attendees (and non-attendees) access to download presentations, video content, photos and more. It's a great way to extend the life of the event and a good excuse to reach out to prospects following the event via InMail. Create a specific presentation to manage the documentation shared with a prospect. Add to it as the you move through the buyer journey including links to customised videos (using UseLoom.com or similar), proposals, quotations, relevant case studies, research studies and thought leadership blogs that might be helpful to their decision making process. Build out the presentation as you build up the relationship. You'll be able to track who else within that account is viewing your content. Create a general company presentation that includes an overview about your business, demo videos, customer testimonials and product sheets. 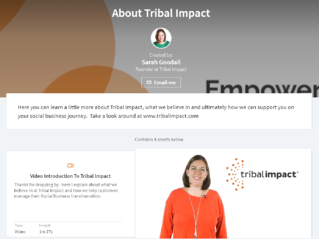 Check out my About Tribal Impact PointDrive Presentation as an example. Use this when promoting events so that those prospects that are considering attending can learn more about your business in advance of the event. If your sales organisation is structured around specific industries, consider creating presentations around content relevant to those industries (and/or technologies). Include a content mix of thought leadership blogs, video interviews with your subject matter experts, industry white papers, eBooks and other material that will reinforce the buyer that your company clearly understands the market. High performing Social Sellers will be curating and sharing articles to their LinkedIn network frequently. Capturing these articles in a place of reference is a great way to say to prospective customers "I work in this industry and regularly share relevant articles - check out what I've shared previously here". 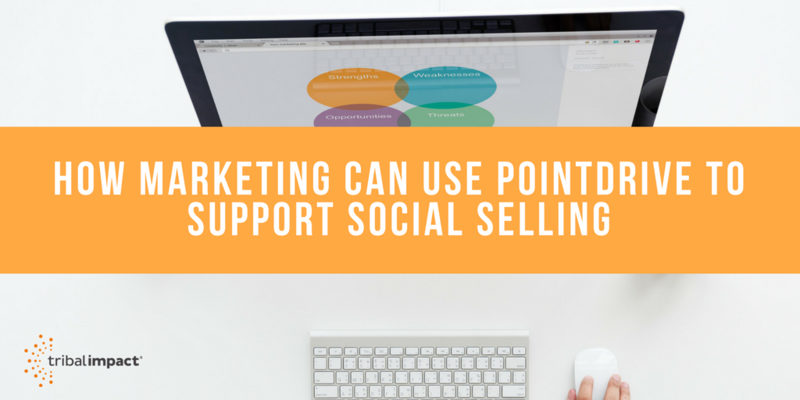 It keeps your network informed and makes your Social Seller a credible source of content. Used constructively, it's a great tool to support the entire buyer journey, whether early on at the awareness stage or further down the funnel at the consideration and decision stage. Content supports every part of this journey and LinkedIn PointDrive provides a way to track the interactions with that content with known (and sometimes unknown) prospects. What's your experience? Can you share any other applications of the tool?